The Apache Hive metastore in HDInsight is an essential part of the Apache Hadoop architecture. A metastore is the central schema repository that can be used by other big data access tools such as Apache Spark, Interactive Query (LLAP), Presto, or Apache Pig. 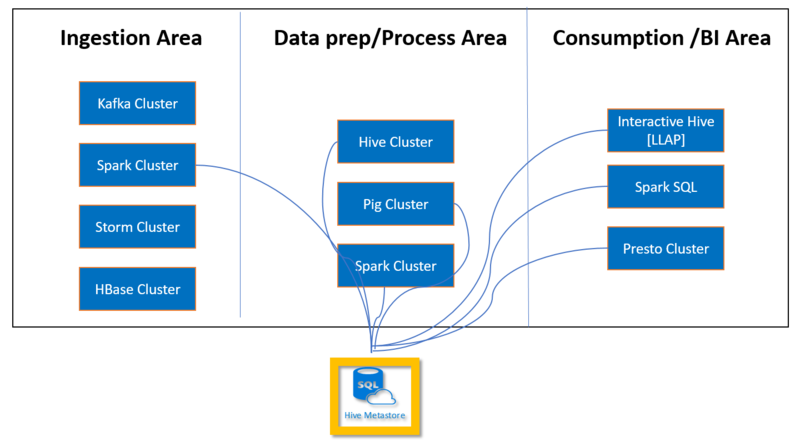 HDInsight uses an Azure SQL Database as the Hive metastore. No additional cost. HDInsight creates a metastore with every cluster type without any additional cost to you. Each default metastore is part of the cluster lifecycle. When you delete a cluster, the corresponding metastore and metadata are also deleted. You cannot share the default metastore with other clusters. The default metastore uses the basic Azure SQL DB, which has a five DTU (database transaction unit) limit. This default metastore is typically used for relatively simple workloads that don't require multiple clusters and don’t need metadata preserved beyond the cluster's lifecycle. You specify your own Azure SQL Database as the metastore. The lifecycle of the metastore is not tied to a clusters lifecycle, so you can create and delete clusters without losing metadata. 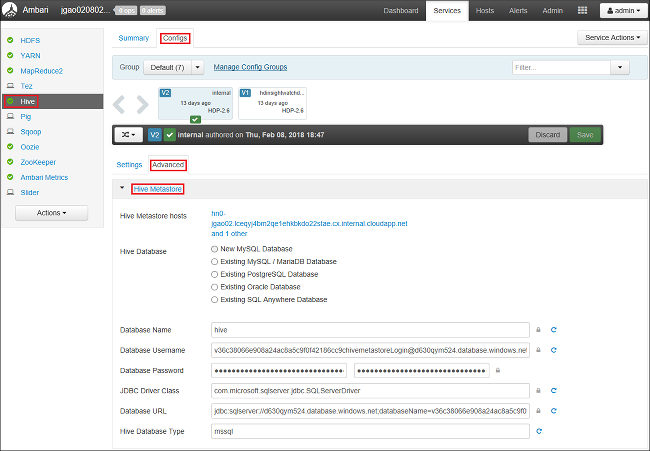 Metadata such as your Hive schemas will persist even after you delete and re-create the HDInsight cluster. A custom metastore lets you attach multiple clusters and cluster types to that metastore. For example, a single metastore can be shared across Interactive Query, Hive, and Spark clusters in HDInsight. You pay for the cost of a metastore (Azure SQL DB) according to the performance level you choose. You can scale up the metastore as needed. You can point your cluster to a previously created Azure SQL Database during cluster creation, or you can configure the SQL Database after the cluster is created. This option is specified with the Storage > Metastore settings while creating a new Hadoop, Spark, or interactive Hive cluster from Azure portal. Use a custom metastore whenever possible, to help separate compute resources (your running cluster) and metadata (stored in the metastore). Start with an S2 tier, which provides 50 DTU and 250 GB of storage. If you see a bottleneck, you can scale the database up. If you intend multiple HDInsight clusters to access separate data, use a separate database for the metastore on each cluster. If you share a metastore across multiple HDInsight clusters, it means that the clusters use the same metadata and underlying user data files. Back up your custom metastore periodically. Azure SQL Database generates backups automatically, but the backup retention timeframe varies. For more information, see Learn about automatic SQL Database backups. Locate your metastore and HDInsight cluster in the same region, for highest performance and lowest network egress charges. Monitor your metastore for performance and availability using Azure SQL Database Monitoring tools, such as the Azure portal or Azure Monitor logs. 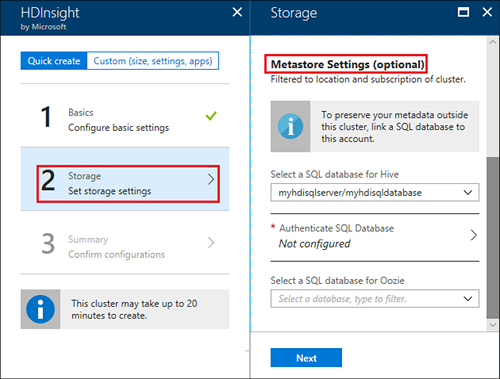 When a new, higher version of Azure HDInsight is created against an existing custom metastore database, the system upgrades the schema of the metastore, which is irreversible without restoring the database from backup. If you share a metastore across multiple clusters, ensure all the clusters are the same HDInsight version. Different Hive versions use different metastore database schemas. For example, you cannot share a metastore across Hive 1.2 and Hive 2.1 versioned clusters. 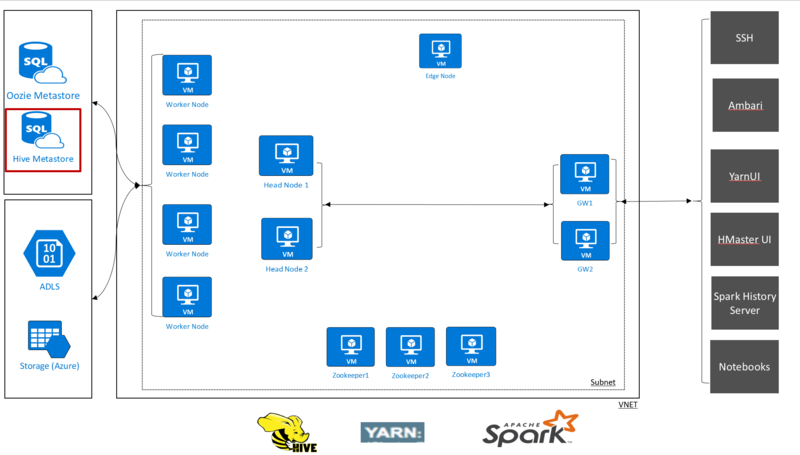 Apache Oozie is a workflow coordination system that manages Hadoop jobs. Oozie supports Hadoop jobs for Apache MapReduce, Pig, Hive, and others. Oozie uses a metastore to store details about current and completed workflows. To increase performance when using Oozie, you can use Azure SQL Database as a custom metastore. The metastore can also provide access to Oozie job data after you delete your cluster. For instructions on creating an Oozie metastore with Azure SQL Database, see Use Apache Oozie for workflows.